QSAN delivers highly reliable surveillance solutions for midsize to large deployment. A good surveillance storage solution is providing continuous protection and instantaneous image access nowadays. The demand for IP/Network-based video surveillance systems and components is getting stronger to surpass the overall global demand for analog video surveillance. The demands lead to higher resolution requirement and the need of bigger storage capacity. The overall data capacity will continue growing exponentially. QSAN SAN series are capable of supporting flexible expansion and integrating to both analog and digital IP surveillance without compromising any performance and reliability. Customer can keep the analog devices and migrate to digital IP surveillance smoothly and seamlessly. QSAN’s new innovative storage solution supports more than 1000 cameras per system from multiple locations. Enormous amounts of recordings are streamed to NVRs for analytics and event handling. Customers may project flexibly depending on requirements and change it over time. Even the original deployment plan was fully considered and arranged. The requirements are changing from time to time. When more cameras and NVR are installed, longer video duration are requested, or higher video quality is demanded, the storage systems must have the ability to expand easily and without impacting the service. QSAN SAN storage systems are easily adjusted and expanded online for nonstop services. To serve security critical environments like banks, airports, financial institutions, retailers, and etc, QSAN SAN series are designed and equipped with fully redundant and hot pluggable hardware components, including dual active RAID controllers, power supplies, fan modules, battery backup modules and even JBOD expansion ports. All of these components are hot-swappable to create a high availability platform and provide non-stop services. To provide HA service quality, the dual active controllers are synchronizing with each other all the time. All RAID controllers have multiple paths for both load balancing and failover mechanism. For any point of hardware or connection failure, the surveillance video will be smoothly transferred and the service won’t stop. From top to bottom, all connections are secure and protected. 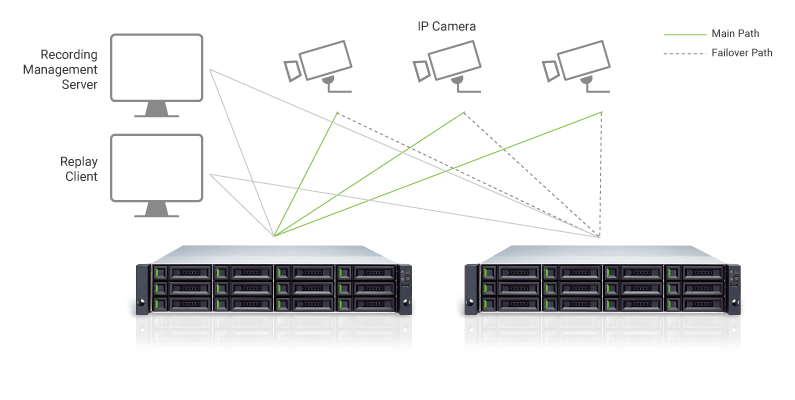 The latest IP cameras support direct recording data to an iSCSI storage system and failover mechanism to second storage system without involving NVR. A central recording management server will control and keep track of system wide recording, monitoring, IP cameras, and storage systems. The setup is easier due to fewer hardware components. Under the topology and the benefits of failover mechanism, the upgrade and expansion service or installation can be done instantly without impacting any services. Thereby the need for NVR or server is waived. The installation, management and maintain is much easier. Therefore the TCO is lower. QSAN iSCSI storage systems support standard iSCSI protocol and all the demands for the Direct to iSCSI Recording solution, including but not limited to, dual active controllers, uncompromised performance, fully redundant system designs, and easy expansion. Data loss happens in all kinds of situations such as hard drive failures, file system crashes from power failures, and even natural disasters. QSAN provides array-based Storage Disaster Recovery Solution which includes QSnap writeable snapshots with Windows VSS support, clone, and QReplica remote replication. The storage planning varies with the main purpose of data volumes. When a video volume is simply for few days duration, a quick snapshot setup would be great idea. But if a video volume contains important security footages and cannot accept any downtime, the video volume’s recovery plan should include multiple, local, and even remote site backup. The local backup can minimize the recovery time and the remote site backup is perfect for immediate replacement for the original video volume. The remote site backup also gives administrators and managers more time to figure out and resolve the issues of the original video volume. When a natural disaster happens, the recovery may take longer than expected which may involve rebuilding new data center.